Nolan Meekhof was impressive at the 2013 Lake Michigan Football Report Combine as just a freshman. He returned in 2014 with a season of varsity ball on his resume and was even better. He’s a powerhouse 6-1, 217 sophomore running back from Grandville who brings to mind physically and stylistically another O-K Red back, Lake Area all-timer Jon Anes from East Kentwood. Meekhof twice ran 4.69 in the 40, had a 30″+ vertical and the top powerball toss over 40 feet. Meekhof projects as either a running back or linebacker. So could Cadillac’s Michael Holdship or Caledonia’s Eddie Kelly. Holdship, a sophomore, was one of the top underclassman defensive players, but could also be MAC fullback with his 4.68 speed at 6-0, 210. Kelly is a 6-0, 204 junior who plays like Portage Central senior Jacob Allan, a long-stride runner who can deliver a hit with or without the ball while showing the hands of a natural receiver. Kelly had a 4.75 40 with a 32 1/2″ vertical. Caledonia should be as tough as ever if their combine contingent is an indication. 5-11, 170 junior QB Kobe Wilson looks like the kind of athlete who could transition to other positions, 6-0, 175 junior running back Logan Soule did well as did Zane Gorby. Gorby really intrigues as a 6-3, 200 sophomore tight end. He was able to create space and give a consistent target. Right now he’s all frame, and no beef. Other standout tight ends were Trevor Raby, a 6-4, 225 Zeeland West junior making the transition from tackle; 6-2, 225 Vicksburg junior Jarrad Whited, who was one of the event’s dominant pass rushers but also took some time to work out with the offense, showing the ability to bring in the ball in traffic; 6-3, 185 junior Cole Butler, a smart, fundamentally strong player from one of Northern Michigan’s top programs, Boyne City; and from one of the top programs regardless directoin, Lowell’s 6-4, 185 junior Josh Branagan. With Meekhof the big back of choice, it was a Woodhead type Plainwell junior Jacob Geter who was the most dominant testing player at camp. At 5-8, 170, he ran combine-best 4.37 40 with a 32 1/1″ vertical and surprisingly also one of the event’s best power ball throws. Those physical tools were evident in the actual football portion, quick in and out of cuts and shifty he was able to repeatedly juke free of would-be defenders. Plays with a lot of confidence and swagger. Geter could be this year’s Danny Bauder. Another standout small back was Reed City’s John Green, at 5-7, 175 and coming off a standout junior season. He ran a 4.65 40. We mentioned Jon Anes. His brother Curt of course was a star QB at EK and then Grand Valley. The Falcons now have another promising signal caller in 6-2, 175 junior Kyle Friberg. He’d be better known but for being born into the Lake Area’s epic QB class. Threw a nice deep ball and has the athleticism (4.7 speed) to make plays outside of the pocket. What really separated Friberg was how quickly he was able to develop a rapport with the receivers he’d just met. His reps had to have had the highest completion percentage of the combine QBs. Frieberg won’t lack for weapons at EK. A couple of his teammates, 5-11, 180 junior David Cutts (with a 34 1/2″ vertical) and 5-8, 150 sophomore Shane Harris, were two of the combine’s top receivers. Another O-K Red QB impressed, 6-2, 215 West Ottawa junior Caleb McNitt, who last season was a tight end while his older brother Jared was WO’s signal caller. If not as quarterback, Caleb will still find his way onto a college roster thanks to 4.75 speed and a 37’8 power ball toss. Oh yeah, and the 4.0 gpa never hurts the cause. McNitt has a promising target in 6-4, 190 junior Braden Carl. He’s a good receiver but not a blazer, so Scott’s best bet for the next level would be to bulk up for tight end. Before he was hurt, Paw Paw’s Jay Doll was one of the most prolific Lake Area quarterbacks in 2014. The 6-0, 190 junior showed the tools behind the number, looks and moves like an athlete. Doll threw a tight ball though the touch varied. A couple Northern Michigan QBs pass the looks test. 6-3, 175 Baldwin junior Brandon Childress has mid-major offers in both football and basketball. His arm was evident here, though he wasn’t always on the same page as his receivers. From Elk Rapids, junior Adam Trautman could project at a bunch of positions at 6-4, 205 with a 4.84 40 and 30-inch vertical. Solid all-around running backs were 6-0, 175 Independence, Tenn. junior Dom Childress; 5-9, 175 West Ottawa junior James Lacy; and 5-10, 210 Holland junior Elroy Payne. Fremont sent a pair of interesting prospects with college position to be determined. 5-11, 185 junior Dylan Collis ran sharp routes and did it with 4.75 speed. 6-2, 160 Fremont sophomore Logan Heddon has an easy stride, can throw or catch, needs some explosiveness that may come with age. All-Lake quarterback Jake Brown (Comstock Park, ’13) led the Panthers to back-to-back Division 4 state semifinal appearances before signing with Michigan Tech. Brown will finish his freshman year at Michigan Tech this spring. Here at the Lake Michigan Football Report, it’s no secret that we love to see players from West & Northern Michigan earn opportunities to play at the collegiate level. We’ve put together a special #ThrowbackThursday Alumni Edition to showcase Lake Area alumni who are currently living out their college football dreams. 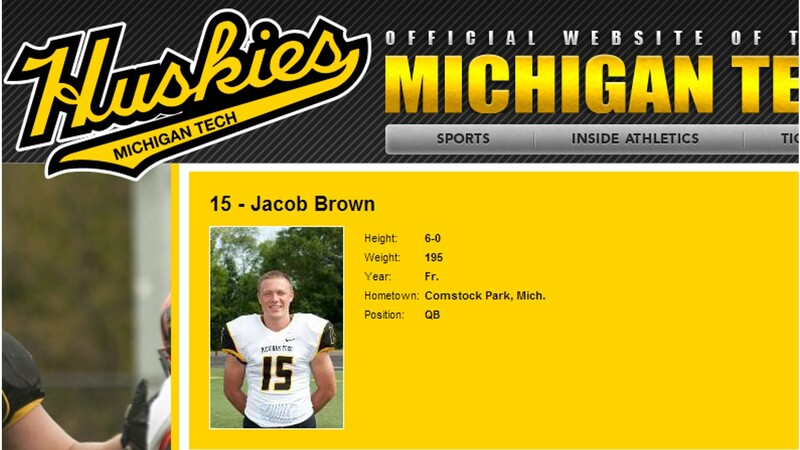 We hope you enjoy the first installment featuring Comstock Park alum and current Michigan Tech Husky Jake Brown! Height / Weight: 6-0, 195 lbs. JB: College football is much more of a commitment and a much more serious game. Everyone on the team has been a star player at their high school and they all love the game of football. It is also different because there truly is no offseason. When one season ends the next season begins. LMFR: Your high school success brought you to the next level, what can your past high school success be attributed to? JB: My past high school success can be completely attributed to my parents, coaches, and community. My dad got me started in football and both my parents always encouraged me to be the best I could be while also pushing me to realize that hard work was going to pay off. My high school coaches also played a big role by handing down their knowledge and helping to show me the right way to do things. And of course, Comstock Park played a great role in my high school success. If it weren’t for all the fans coming out to the games we wouldn’t have gotten the new stadium renovations that we are getting nor would playing in a playoff game at home been as fun. All the players fed off of their energy. JB: I am currently majoring in bio-medical engineering. When I graduate I would like to work with either prosthetics or in biomaterials. Balancing academics with athletics can be a little tough when going to a school like Michigan Tech. But I have learned that I have to budget my time very well and be sure that I know what I need to do each day so that all homework can be done and I can be ready for exams. My fall football schedule is very structured with practice followed at night by a mandatory study table. This also helps to keep my academics up. LMFR: What position are you currently projected to play during this upcoming year and what are some things you are looking to contribute to the team? JB: I am currently going to play quarterback next year. Right now it appears that I will be learning for at least one more year from our All GLIAC starter Tyler Scarlett. This season I want to learn as much as I can so that I can be ready when my number is called. JB: At the Lake Michigan Football Report combine I first of all had a blast. It was a time for me that I could just relax and throw the ball around to a bunch of very talented athletes. It also helped me to throw to receivers that were much faster than what I was used to at times and learn to adjust. I had a blast. It is nice to be able to be looked at as a good football player at your camps rather than being looked at as an undersized talent. Lots of guys out there are “undersized” but showing out at your camps. LMFR: Special thanks to Jake Brown for the interview! We wish you all the best!